That it is not a sure thing for the Black Knights, who haven’t lost since going to overtime at Oklahoma in September, shows how odd the bowl system can be. 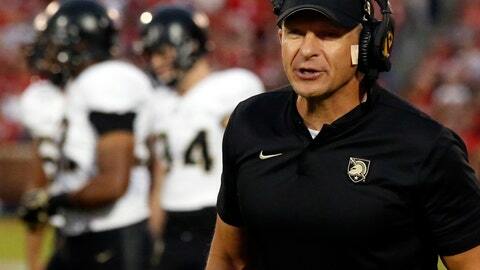 Athletic director Boo Corrigan has been working on Army’s postseason problem for months since the program entered the season without a contracted bowl partner — and this is no time to be a free agent on the bowl market. “The good thing for us is the next cycle will be 2020-25 and we can go into that cycle as an independent showing that we have been bowl eligible, showing that we’re a viable team to fill that slot,” Corrigan said. Army’s situation had Corrigan tracking nine games last week, including Florida Atlantic vs. Charlotte, involving teams trying to become eligible. “It’s a weird dynamic in our profession to want someone not to win,” Corrigan said. “It was nerve wracking,” he said. BYU’s television deal with ESPN since going independent in football in 2011 has given the Cougars access to bowls from San Francisco to Miami Beach. ESPN Events owns and operates 14 bowls. BYU had been penciled in for the Poinsettia Bowl in San Diego, but that game went under before last season. “And that’s why even though we have an agreement with ESPN that they’ll put us in a game we’re not going to know what game that is until the dominoes fall,” Holmoe said. Every conference championship game this weekend affects the bowl lineup and can create openings or fill spots, depending on which teams land in the four-team playoff or New Year’s Six games. And then there is Virginia Tech, which is 5-6 and playing Marshall on Saturday to make up for a game canceled by Hurricane Florence — but also in hopes of getting that crucial sixth win. The Hokies could give the Atlantic Coast Conference 11 bowl-eligible teams to fill 10 spots it has contracts for. Army probably won’t have to resort to lip syncing pop songs, but Corrigan won’t be totally at ease until an invite is in hand. “We’ve been living and dying for six weeks,” he said.